PHILADELPHIA — Green Party presumptive presidential nominee Dr. Jill Stein is no Ralph Nadar, but Iowans Holly Hart and Wendy Barth also understand this isn’t a typical election year. The two are long-time Green Party members and activists who will travel this week as delegates to the party’s Presidential Nominating Convention in Houston. Barth, of Cedar Rapids, was a Green Party candidate for governor in 2006, after joining the party in 2000. “I became involved as soon as I became aware that Iowa had a Green Party,” she said, noting that she had long been concerned about the environment, which is a key issue for the Greens. 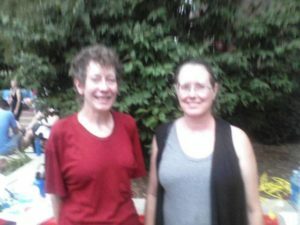 Green Party members Holly Hart and Wendy Barth. This cycle she is co-chairwoman of the party’s Presidential Campaign Support Committee and serves on the Ballot Access Committee. As a part of those groups she’s helped set up the process by which Green Party presidential candidates are selected and worked to ensure the chosen candidate is on as many state ballots as possible. At present, the Green candidate will appear on the ballot in 23 states, including the District of Columbia, and party activists expect to qualify for at least 20 more before filing closes in early September. Party leaders expect to file their paperwork and petition signatures with the Iowa Secretary of State on Monday. State law requires the group to gather 1,500 signatures in order to qualify for the ballot. “Here in Iowa we view the ballot process as a bit of chore, but the Iowa rules are actually less onerous than in other places,” Hart said. A key difference, Barth said, is that any legal Iowa voter can sign a petition to place a third-party candidate on the ballot. Other states have narrowed the rules so that only people registered in the third-party can petition. Still, it can be difficult. Lesser known parties don’t have the resources of the two major parties. They don’t have offices, staff and don’t benefit from tax checkoff funding. As of last week, the Greens had gathered more than half the signatures they needed, and both were cautiously optimistic that they would be able to file well before the Aug. 19 deadline. “Unless something goes unprecedentedly, very strangely wrong — which, in politics, that could happen — we’ll be on the Iowa ballot,” Hart said. And, thanks to this year’s unusual political climate, the Greens have garnered some new help. Even before fractures within the Democratic Party were put on display this past week, Barth said the Greens were “absolutely” benefiting from the crossover of Bernie Sanders delegates. Hart says the interest has not yet risen to the level the party experienced with Ralph Nader in 2000, but that some who had expressed interest were waiting to see what came out of the Democratic National Convention before making a final decision. 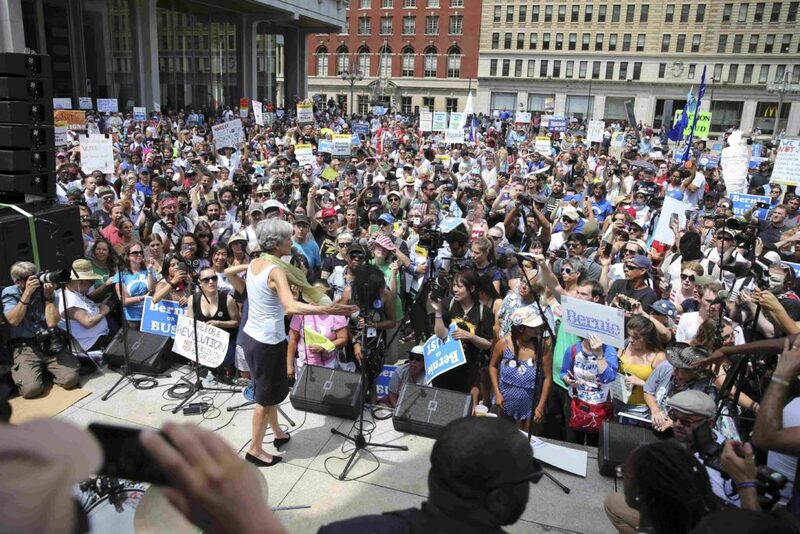 Green Party presidential candidate Jill Stein speaks during a rally of Bernie Sanders supporters outside the Wells Fargo Center on the second day of the Democratic National Convention in Philadelphia, Pennsylvania, July 26, 2016. That’s obviously a message presumptive nominee Stein had heard as well since she and other Greens spent most of the week appealing to disaffected Sanders supporters who walked out of the convention. “We say forget the lesser evil, and fight for the greater good,” Stein said. The responding shouts of “Jill, not Hill” grew louder with each passing day, at times morphing into much less family-friendly chants. Still, as far as Iowa goes, Hart doesn’t believe the Greens will play spoiler since, historically in close races, Iowans planning to vote third-party will revert to their second choice from one of the larger parties. If the Greens could reach “the magical” 2 percent of the vote that would qualify them for automatic ballot access that would be great, she added. “Compared to 2000, this is not yet as big as the Nader campaign and I’m not convinced yet that is where we are heading,” Hart said. For now, Barth is content with the additional interest and manpower. “We need to get to the point where we can actually have an office and hire staff so we can do more things like get out the vote,” she said. The Green Convention gets underway Thursday and continues through Saturday, Aug. 7. In addition to nominating a presidential candidate, the Greens will hear speeches, enjoy social activities and participate in a wide variety of educational workshops. Two prominent Bernie Sanders supporters — Cornel West, who was chosen to serve on behalf of Sanders on the Democratic Party’s national platform committee, and singer and songwriter YahNe Ndgo — will be among the keynote speakers.